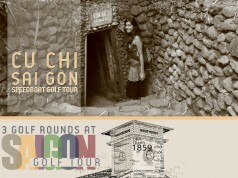 The 4 rounds golf tour of UniGolf which will give you a truly great experience at the Southeast Saigon’s top-ranked golf courses: Long Thanh Golf Club, Vung Tau Paradise Golf Resort, Vietnam Golf & Country Club, Song Be Golf Resort and offers many opportunities to discover the bustling city of Saigon and Vung Tau Beach City. Perfect mid point location on the way to Vung Tau City where is just about 40 minutes by car from Ho Chi Minh city. This Golf Plan-designed golf course is generously endowed with a naturally undulating topography which is endlessly interesting to play for golfers of all abilities. The 36 holes are separated into two 18-hole championship courses: Hill and Lake course. Hill Course which is more challenging for professional golfers, measures 6933 yards and is constructed on a plateau that offers magnificent panoramic views over the water and countryside. Lake course which measures 7109 yards, are dedicated to serving new golfers and making them feel welcomed. 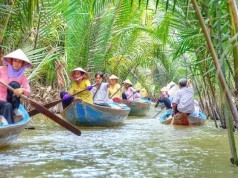 The course is surrounded by the branches of Dong Nai river that offers cool breezes to this area. Lake course has a good design with international standard light system for night golfing. The 27-hole golf course is constructed on a gently sloping terrain with concaves and deep hollows, creates terraces for golfer’s eyes. It is designed based on the ball direction of the world’s champions and it is reproduced under shape of the golf courses that used to welcome presence of famous persons. 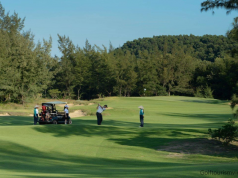 After 15 years of operation, Vung Tau Paradise Golf Resort is the favorite place for many Vietnamese golfers as well as international groups of tourists when they arrive in Vung Tau to play golf and rest. The white sand beach where is just about 5 minutes on foot is waiting for you when you finish with golf. 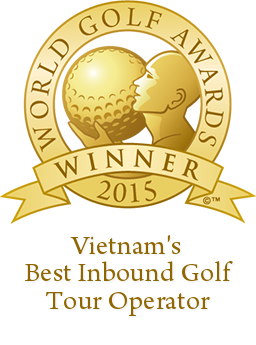 Your Vung Tau golfing journey will be unforgettable. Vietnam Golf & Country Club is the nearest golf club to the city which is located just 20 kilometres from the centre of Ho Chi Minh City. Vietnam Golf & Country Club is the first international golf course in Vietnam which has 36 holes. This is also the course which organized the first amateur golf championship of Vietnam. The course winds its way through the trees offering challenging tee shots to the tree lined fairways before playing to the softly contoured Bermuda TifEagle greens, which provide beautiful putting surfaces all year round. Nestled in a nature oasis, Song Be Golf Club features a 27 hole USGA standard Championship Course, which promises a very unique and invigorating experience. Located on an area of 104 hectares, the course offers well-bunkered, undulating greens, generous fairways and 14 beautiful lakes. This new scene is ensured to create many attractions as well as setting new goals for you to conquer. Ho Chi Minh city: Lavender Hotel or Royal Lotus Hotel Saigon. Lavender Hotel is located in the center of HCMC, near Ben Thanh Market, Notre-Dame Cathedral and Opera House. This is a wonderful choice for business tourists, near many trade centers and international consulates. All rooms are elegently designed with modern equipment, creates a warm feeling. The hotel has many well-equipped conference rooms, offices and library. The restaurant and Lavender Hotel Bar overlooks Ben Thanh market and the city center, attracts gourmets not only by its attentive services but also by the specialties of Vietnam and the West. In Vung Tau, you will be resting at DIC Star hotel or Muong Thanh Vung Tau Hotel. With a beautiful coastline, DIC Star hotel is located on Thuy Van Street, the center of Bai Sau Beach Resort. Yellow sand bank, intermittent waves with white bubbles, people playing with the waves… DIC Star hotel consists of 88 rooms with standard, deluxe and D.I.C Suite rooms. The rooms are equipped with high-end devices. Large room space, wood floor creates a clean airy feeling with luxury. 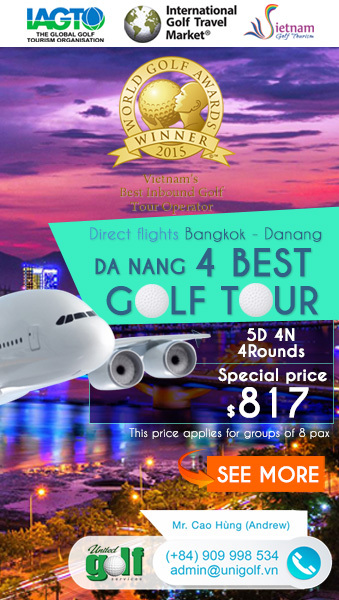 Day 1: Car takes golfers from the Tan Son Nhat airport to Long Thanh Golf Club to play one golf round and then head to Vung Tau, check in at DIC Star hotel or Muong Thanh hotel. Day 2: After breakfast at the hotel, car takes golfers to Vung Tau Paradise Golf Resort to play one golf round. Then, come back to HCMC, check in at Royal Lotus Hotel or Lavender Hotel. Day 3: After breakfast at the hotel, car takes tourists to Vietnam Golf & Country Club to play one golf round. After the game, car takes tourists back to the hotel for resting. Day 4: After breakfast at the hotel, car takes tourists to Song Be Golf Resort to play one golf round, car takes tourists to the airport. End of services.